In a nutshell, Looper attempts to blend Inception and Matrix. And while the leads are strong (though, I've seen Willis perform better), the production doesn't quite rise to the caliber of those references. Maybe it's the obviously movie-made versions of our modern cars, or the small one-dimensional cityscape, but the film just feels a little rickety and small. Rickety aside, the filmmakers may have been going for that cramped claustrophobic feeling for the city in order to contrast it with the wide open and free air of the rural farm setting -- which they achieve winningly. Perhaps it's no surprise that it's here on the fertile farm soil that the film's blossoms break through its violent surface. Any film hinging on time-travel will necessarily try to hide the inevitable implausibilities. 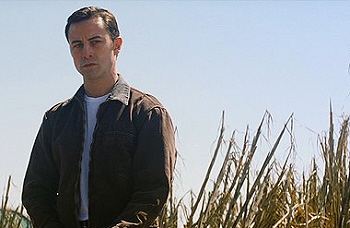 But to its credit, Looper eventually begins to engage enough that viewers will surrender to the film's logic. While quite violent in cramped spaces for long periods of time, the film searches for more redeeming elements in its bigger-sky second half. I wouldn't call it a film with a good heart, but it eventually comes to a conclusion that's both quite interesting and somewhat humanistic. Starring Bruce Willis, Joseph Gordon-Levitt, Emily Blunt, Paul Dano, Noah Segan, Piper Perabo. Directed and Directed by Rian Johnson at Sony.